When your members are looking to help fill a specific need of other members or they have a special need of their own, an online Classified Ad system is an excellent way for you to help them meet that need. Needs such as a new or used vehicle, an available service such as babysitting or a Christian CPA or job openings and résumés can all be posted on a Classified Ad system and then made available to others, once the ads are approved. You can separate the Classified Ads system into multiple content categories to better differentiate different types of listings. 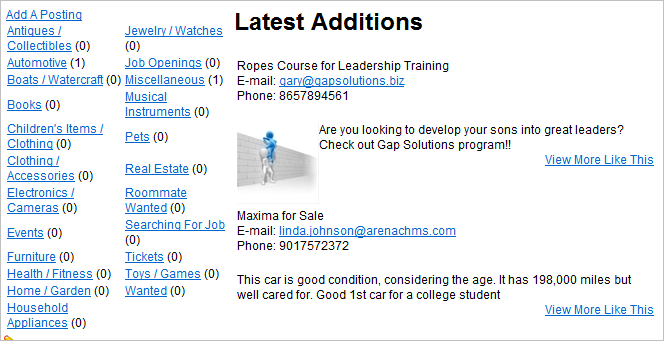 By default, Arena comes with two content categories—Classifieds and Business Directory. Use the Classified Type lookup to customize the values. You can add additional content categories and listing categories in these tables, but the method for adding them to your website remains the same. To implement each classified category, three pages are required. Customize the Classified Category and Classified Type Lookups. Customize the Classified Approval page, Classified Expire Days, Business Directory Email, Business and Directory Expire Days Organization Settings. Start the Classified Cleanup Agent. Customize the Classified Approval System Email. Create Security for staff members who can view, edit, and/or approve the ads. Business/Classifieds page – This page is the initial page your members see when they navigate to this area. This page displays a listing of categories with a sum of the number of items in each, a link to add a new posting, and a special list of recent additions. We suggest you place this page behind a secure login and it needs to be visible in navigation. The page requires the Classifieds Categories module with Add/Edit Page set to Classified Ad Entry, Category Detail Page set to Classified Ad Details, Classified Type set to Classified for classified ads, or set to Business Ads for business classifieds, and other setting. Business/Classified Ad Details page – This page displays the details of all classified ads in a category. This page should be a child page of the Classified Ads page and set to not display in navigation. 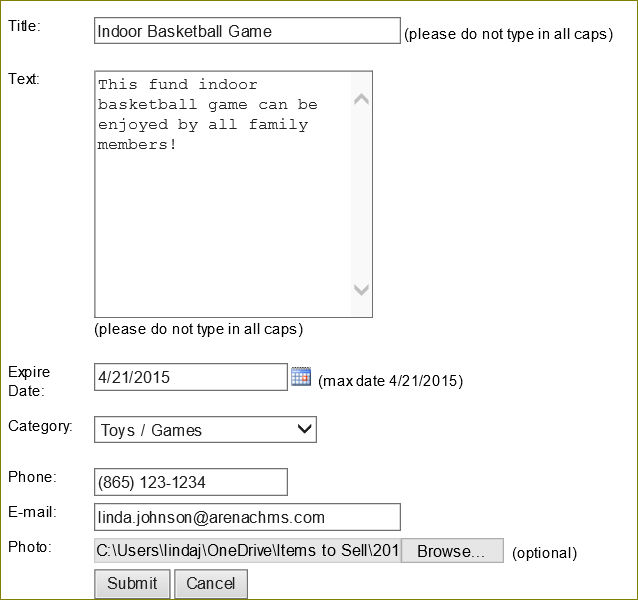 This page requires the Classified Category Details module, with Content Category set (Arena is the default), the Edit Page set to Classified Ad Entry, and other settings. 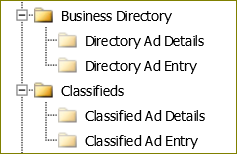 Business/Classified Ad Entry page – This page displays users existing classified ads and a button to add a new item. Once the person clicks the Add Item button, they can then fill out the form that displays to add the item to their classified ads listing. This page should be a child page of the Classified Ads page and set to not display in navigation. This page requires the Classified Entry module, with Classified Type set to Classified for Classified Ads or to Business Ads for business directory, Content Category (Arena is the default), and other settings. Once configured, members can then submit new entries and view approved submissions. Once the Ads are approved, they are available on the Classifieds page.